Provide a fresh perspective on local news and information in a reader friendly attractive format. Our staff is a group of dedicated, civic-minded professionals with many years of experience in keeping their fingers on the pulse of Southwest Florida. Our goal is to put readers in touch with the area in which they live and play. With that, we bring them closer to you, the business owner. Your message in Coastal Breeze News will be received by over 40,000 readers with each edition! With today’s business trends, we understand your need to target advertising where it’s the most cost effective. The Coastal Breeze News rates and distribution have been designed with that goal in mind! Call today to see how we can help your business grow. Coastal Breeze News publishes and distributes 12,500 to 17,500 copies each edition (depending on season) every other week to over 500 locations in our coverage area. Based on newspaper industry standards showing an average of 2.5 readers per copy, Coastal Breeze News advertisers can reap the benefits of reaching over 40,000 people per issue! Our coverage area includes Marco Island, Isles of Capri, Goodland, east & south Naples, Everglades City and Chokoloskee. These are vibrant communities with commerce, recreation and entertainment intertwined in their appeal to full-time residents, visitors and seasonal residents. Coastal Breeze News circulation is audited by the Circulation Verification Council which uses the most thorough stringent methodology in the industry-meaning you can TRUST our numbers! Sizes are for a quick look at our rates, other sizes available. All prices include full color. Nonprofit organizations with 501c 3 status, annual rate. Deadline is now Thursday at 1 p.m., one week prior to publication. Ads requiring proofs MUST adhere to this deadline with final proof corrections received by 5 p.m. Monday. Classified deadlines are Friday at 12:00 PM, one week prior to publication. Do not submit ads done in Microsoft Publisher or Excel. We prefer .pdf format for materials, but can also accept .jpg or .tif versions. Use 200 to 300 ppi (pixels per inch) to accommodate our 100-line screen with a 30% gain. All fonts must be embedded in the file. We use a CMYK format. *Black text MUST be at 100% black (100% K only) for proper reproduction, NO OTHER color layers. Digital photographs must be 200 to 300 ppi and large in size. Internet images at 72 ppi will not reproduce in newsprint. Headline Focus: Be concise and entice the reader to read the rest of the copy. Typefaces: Utilize bold, italics and spacing without mixing a variety of typefaces. White Space: Make sure there is enough open space in your ad, not too busy. Reason: Create a sense of urgency; give a reason to buy now. Simplify: Say what you want to say but keep it simple, not wordy. Images: Logos and photos attract attention and are recognizable. Two line ads up to 20 words each are free. Extra runs, additional words or features are extra. Call for a quote or find the form online at Coastalbreezenews.com. All display advertisers receive classified line ads free of charge. Click here to go to ‘Classifieds’ and download/print a classifieds ad request form. Inserts start at $25 per thousand, with materials supplied no later than 8 days prior to insertion. 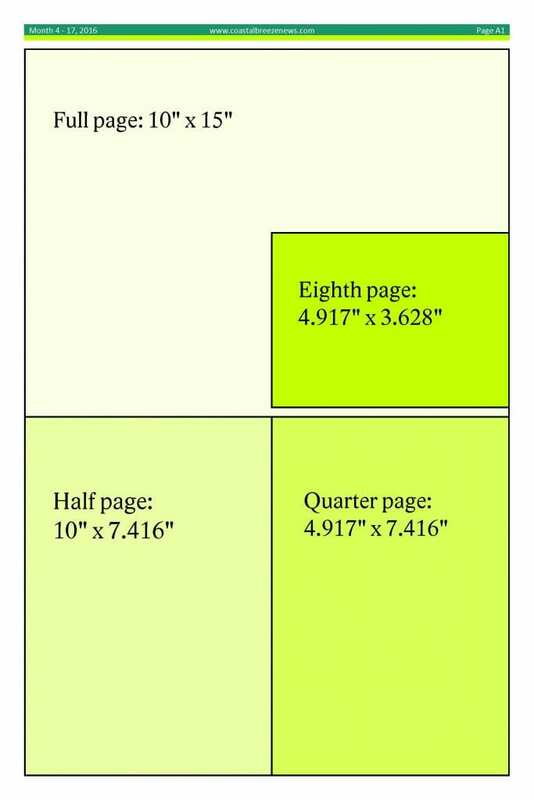 Multiple page inserts or printing quotes are available. Call your marketing representative for information. If you would like to set up an account for billing purposes, please see your account representative for information. Until credit account has been approved, ads require cash in advance and are eligible for a 2% discount. The Publisher has the right to reject or refuse any advertisement for any reason and is not bound to disclose such reasons. We work diligently to make sure our advertisers are pleased with their ads. Coastal Breeze News and Coastal Breeze Publishing cannot be held liable for any errors or omissions due to negligence or otherwise. Total liability is restricted to the first run of any advertisement and limited to running at no cost the amount of space equal to that in which the error occurred.